I consider myself a friendly person. A person who happily “gives away” a smile. I find a smile is contagious. And it immediately makes you feel better. A smile puts a smile on someone’s face. I love watching the kids smile as they do something they enjoy, watch something they like or look forward to something. And while I was watching my daughter smile while looking at a couple of pictures of her and her friends, I couldn’t help myself smile as well, although seconds before I didn’t feel like smiling at all. I thought about how sad the world would be without those smiles. How people would probably interact even less. Suddenly I remembered a book Nicolas C. Rossi wrote and I started digging for the post which I’d love to share here as a Blast From The Past. Imagine you wake up and your smile is missing. That’s what happens to a little boy in a story written by a blogger friend of mine. Now imagine… Imagine your smile would be missing suddenly, nowhere to be found. And you would have no clue why and how it went missing. ‘The Runaway Smile’ is an award winning children’s book written by Nicholas C. Rossi (see link below) and I highly recommend reading it, although I have not yet finished it myself. The idea of a little boys smile gone missing stuck to me the moment I’ve read the intro and then the beginning of the story. The story is kept light while you join the boy on his search for his smile, which he first thinks is somewhere under his bed with heaps of other stuff. For me though, there was something else standing out. The scary ideas of smiles disappearing. Especially the ones of children. But the children are different. They always seem to see something in this world worth a smile. They giggle and sparkle and it’s contagious. So they might put a smile on an adults face. Just by watching them, by listening to them. The lightness the children still feel in this world seems to touch us again for that split of a second. When we lose our smile, sadness moves in. It takes over. Sadness and sorrows. When I think of these two words I see the color grey and I feel the cold. The picture I get in my head is the one of a grey, cold and foggy day. And there is no getting out of it. Imagine the bright and colorful world of a child suddenly gets grey and cold. Imagine the smiles of our children disappear and they get sad. It’s bad enough that we as adults, as parents have to feel an amount of pressure that has the ability to take the fun out of life. Now if our kids get there too, what a sad world will it be? Our children are not immune to depression and to a burn out. The more pressure we put on them, the more their innocent world changes into an adult world. A world we find ourselves in and frankly sometimes hope we could escape and go back to being a child. Right? I’m sure the boy in the story will find his smile. He has probably misplaced it. But what about the real world? What about all those people who can’t find their smiles anymore. What can we do for them to help them find their smiles again? Keep those smiles! Cherish them, don’t lose them! We all need them, we all need to smile and to see a smile on someone’s face. Thank you, Nicholas C. Rossi, for writing such a lovely book and for provoking some thoughts here. This entry was tagged Blast From The Past, Inspiration, Kindness, Life, Smile. Bookmark the permalink. As for the boy, he does get his smile back when his mother shares her own smile with him. So, it’s pretty much like your post says: it takes another smile to (re)start his own! It is easy to approach people with genuine smiles. Goodness what a concept to think about. I know it’s cliche but I believe there is a saying that smiles are free so let’s give them away. I’m going to really try to smile more. Love this. Thank you for sharing! I do love the idea of sharing smiles, and I try and smile at people as often as I can. 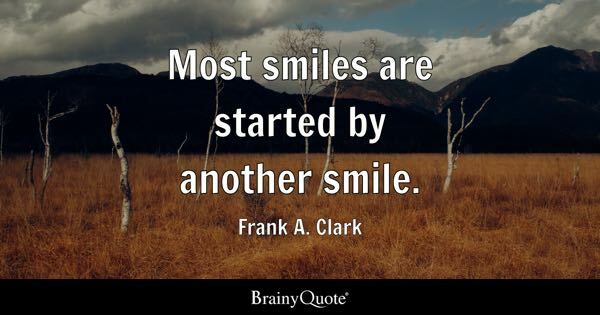 I know it always feels nice when someone smiles at me – or smiles back – especially if they aren’t someone I know or know well (you’re just kind of passing each other). A lovely post about smiles, inspired by my very own Runaway Smile!! My smile was broken for several hours. There is something in a very common toothpaste that made my lips swell. The swelling wasn’t noticeable, but I couldn’t smile freely. I avoid that brand now, because I NEED my smile! Oh no!!! Glad you got your smile back! Smiles are truly contagious. I’m glad to hear that Rossis confirms that he does get his smile back! I couldn’t imagine a world where we never see a child’s smile or hear their laughter.